Image caption Naeem Mehmood killed his boss in an "unprovoked attack"
A man who admitted stabbing his boss 51 times before going on a "rampage" with a machete has been jailed for life. Father-of-three Parvaiz Iqbal, 40, was killed at his shop on Grosvenor Road in Eastwood, Rotherham, on 15 October. 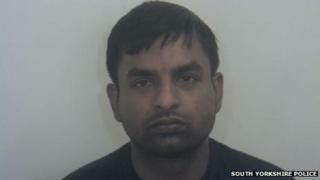 At Sheffield Crown Court Naeem Mehmood, who admitted murder, was ordered to serve a minimum jail term of 27 years. The 27-year-old ran through Rotherham smashing car windows and threatening people with a machete after the attack, before being stopped by police. Mehmood, of Herringthorpe Valley Road, Rotherham, also admitted causing grievous bodily harm with intent to his co-worker Saeed Hussain, who was stabbed in the stomach when he tried to help his boss. Sheffield Crown Court heard Mr Iqbal was found at Bismillah Food Store with a 7in (18cm) knife stuck almost up to the hilt in his chest. Mehmood came to Britain from Pakistan in May 2011 and got a job at the shop in June 2013, the court heard. He went on sick leave in August after part of his finger was chopped off in a machine, and returned to work the day before the attack. Sentencing Mehmood, judge Mr Justice Males said: "This was a brutal, sustained and unprovoked attack, beginning with a cowardly stab in the back by a lethal weapon. "The aftermath, as you left the store and rampaged down the road in broad daylight for about 10 minutes, leaving a trail of destruction behind you, caused real and understandable fear to many members of the public." He was eventually arrested after he was confronted by an unarmed police officer who persuaded him to put down the 10in (25cm) machete he had picked up in the shop. Dozens of people in Rotherham posted on Twitter as Mehmood was seen running through the town. South Yorkshire Police said the force began receiving a "large number of calls" at about 14:00 BST on 15 October. Mehmood was arrested in the car park of Tesco supermarket 12 minutes after the first call, police said. Det Supt Dave Barraclough said after sentencing: "As the case has not gone to trial, the exact reasons why Mehmood chose to attack his boss and colleague in such a violent way remain unclear. "He had only recently returned to work and the innocent victims in the case were simply going about their daily business when Mehmood launched his unprovoked attack." Mahroof Hussain, a relative of Mr Iqbal, told BBC Look North his death had had a big impact on people in the area, particularly as it happened on Eid. "On that day a lot of people mourned, I don't think anybody in Rotherham that day celebrated Eid at all. "If you went to Parvaiz's shop he made you feel like you were part of the shop, a member of his community and his family. "He treated everybody with such respect."